Dogs Luv Us and We Luv Them: Dogs Love The Beach! Ahh, the Dog Days of Summer. 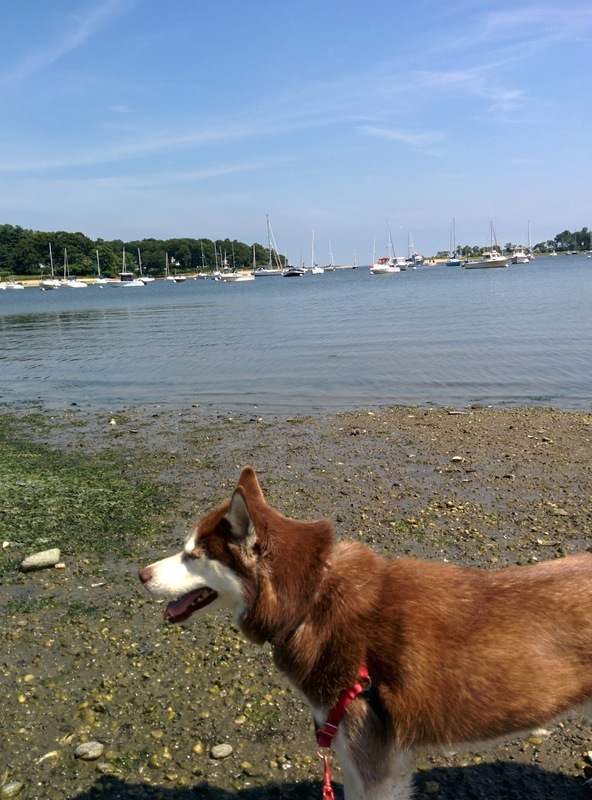 One of the highlights of Summer is taking my dogs to the beach! My dogs love the beach. Dog welcoming beaches can be great fun and great exercise for dogs. 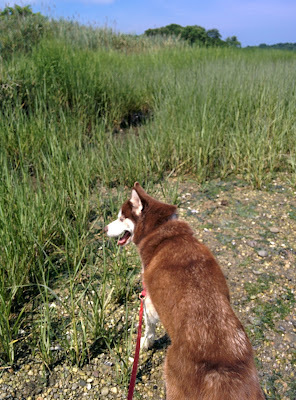 This morning I took Icy to a nearby dog friendly beach. What fun we had!! 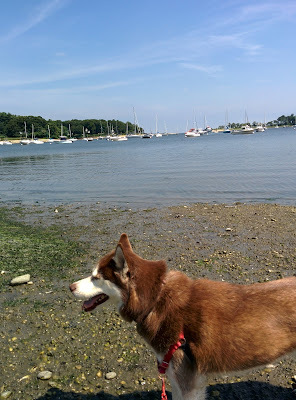 Here are a few photos of me and Icy cooling our paws off at the seashore! What better way to cool one's paws than at the beach!? 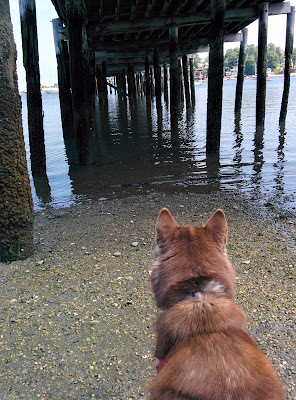 Oh look at this, a dilapidated old dock. 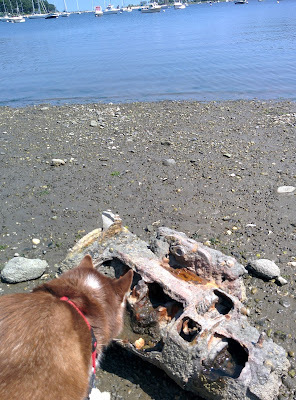 When at the beach, a savvy dog must always be on the lookout for shipwreck treasures that may have washed up along the shore! Ok so perhaps this is just some weird garbage that washed up on shore, but you never know! 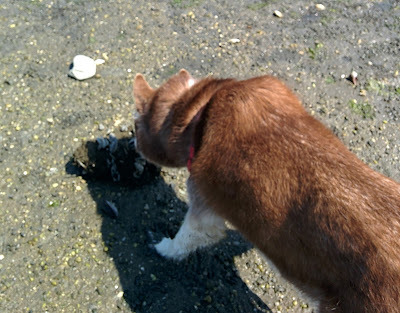 Savvy dogs must also investigate possible edible life forms that are normally hidden when the tide is high. Today we went to the beach at very low tide so these delicacies have been exposed! Ma wouldn't let me snack on these delicious looking mussels, she's such a beach-party pooper!! Dogs never fail to find all manner of, how shall I say it...... Yuckiness at the beach! Again, Ma the supreme beach-party pooper only let me sniff it for a moment. But a moment was all I needed to catch the sheer essence of this delightful thing! Another thing you can't help but encounter at the beach are sand dunes and tall grasses. Beware! Monsters lurk within these tall grasses. The monstrous things known as Fleas and Ticks just love to inhabit these grassy knolls. You must fight them off by being diligent with flea and tick prevention. Do you know about the flea's lifecycle and how quickly a flea infestation can occur in your home?? Enjoy the tall grasses but protect yourself! Whew! We're exhausted from our dog beach exploration adventure. Goodbye dog beach, see you next time! I hope you enjoyed sharing our fun doggie beach day. When you take your dog to the beach, be sure to follow these Beach Safety Tips for dogs! If the beach you bring your dog to is near a marina or fishing boats, watch out for this danger to dogs at the beach! Do you take your dog to the beach? Please leave us a comment and share, we'd love to hear about your dog beach adventures!! It is so lovely! 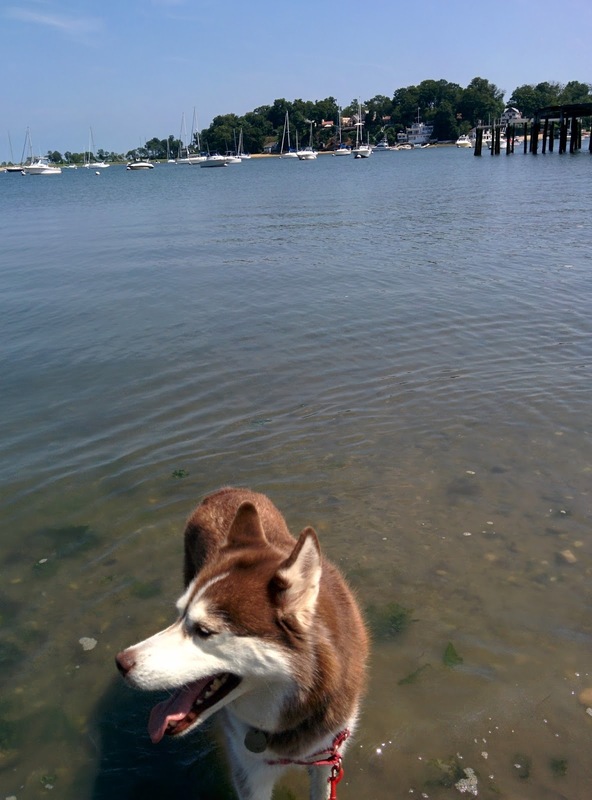 I think so many dogs love exploring & romping in the water at the beach! That is lovely but I think you made the right decision on the pier and the yuck! BOL! 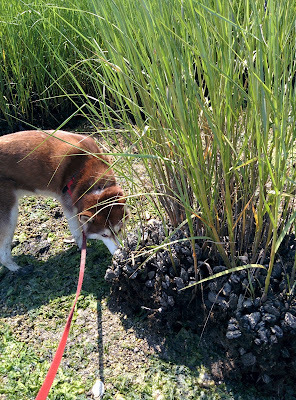 Wows, so many FABulous thingies to explore and sniff!!! sorry abouts only gettin a whiff of that stinky thing...I would have rolled on it before Ma could stop me!!! BOL!! It was a great day, we loved it! I love rolling in the stinky stuff too but Ma always pulls me away too fast, beach-party pooper that she is! Oh Yeah!! You guys got the idea, it's pure heaven! Look at all that funny stuff to smell and explore! I bet Penny would love the beach... I just need to find a dog friendly one. Dog friendly beaches are the best! I hope you find one nearby. What fun!! Henry doesn't have much beach experience, so he's very confused by waves. This looks like a great beach and a great day! 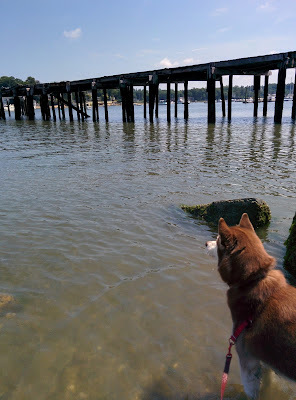 Icy was freaked out by waves at first too, but she quickly got used to them after we decided to start her on the bay side & move to the open ocean end. Magic would love it--all he gets, though, is wading (when I let him!) in the stinky cow ponds. BOL!! Maybe one day Magic will know the magic of the open ocean! Oh yippie, dogs at the beach are so much fun! Looks like you had an adventurous trip to the beach! I have been to the beach a couple of times with Miss Edie, but she's not too thrilled with getting too close to the water ;) She does find the geese very interesting though! I'll bet Miss Efie just loves those Geese, that must be a hoot! Icy looks like she was having a blast! I love taking dogs to new environments, we can't possibly imagine the wonderful range of smells they're experiencing all the while. I'm sure, I can only imagine the olfactory overload at beaches, LOL!! It's always a nosy adventure for our canine companions! And yeah finding the stinky is a real "thing"!! Oh definitely an olfactory adventure of the highest order! It's all about the stinky, LOL! Looks like so much fun! Goose has never been to the beach! I am going to try this fall to make a point and go out so he can experience it. 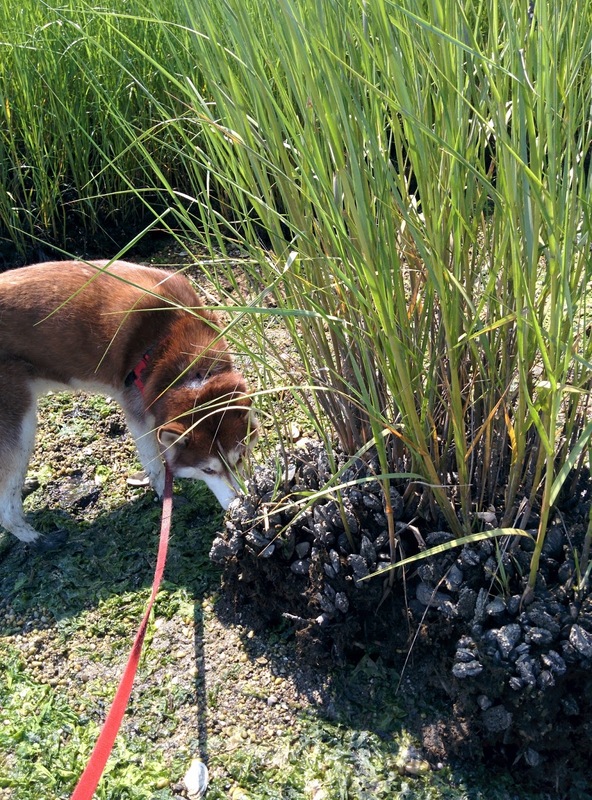 Dogs + beaches are fun, but be careful what you sniff and eat - right? I am so glad you had some nice weather and the photos look terrific! It looks like you had a great time at the beach! I wish there was a beach nearby us! This gives me beach-envy! I wish we had a dog beach (or any beach really) here in Arizona! Mr. N has found a ton of gross stuff at the beach! We have to stop him from rolling on it. Can't wait for you to see Myrtle Beach next summer. They have limited times when dogs can be on the beach, but it's a beautiful beach. What a fun post. 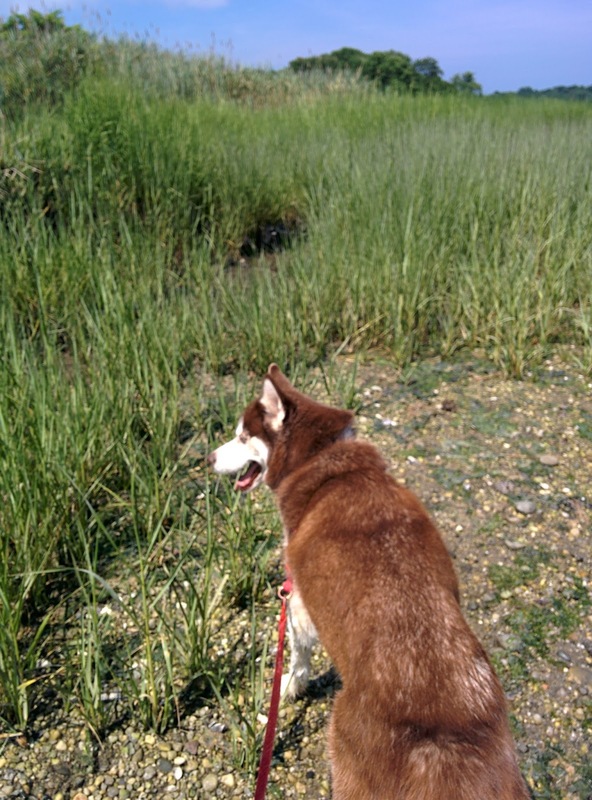 When we had Lakota, our huskey he wouldnt ever get near the water! Great pictures of what looks like a really fun and relaxing day! Great photos! It looks like you had a fun adventure. Cheers to many more and thanks so much for sharing!